Platelet P-selectin and activated glycoprotein IIb–IIIa (GPIIb–IIIa) are markers of platelet activation and mediates platelet aggregation. Prasugrel (Pras) 5 mg may be used in very elderly (VE) acute coronary syndrome (ACS) patients undergoing PCI, but its effect on platelet P-selectin and activated GPIIb–IIIa in those patients is not known. Stable ACS patients, VE (78 ± 5 years, n = 23) and non-elderly (NE) (55 ± 5 years, n = 22) were randomized to Pras (5 or 10 mg) or clopidogrel (Clop) 75 mg during three 12-day periods. Platelet activation markers were measured by flow cytometry on unstimulated or stimulated (adenosine diphosphate (ADP) 20 μM) platelets, before and after each dosing period.Results: At baseline there was no difference in platelet activation markers, either unstimulated or ADP-stimulated, between NE and VE. 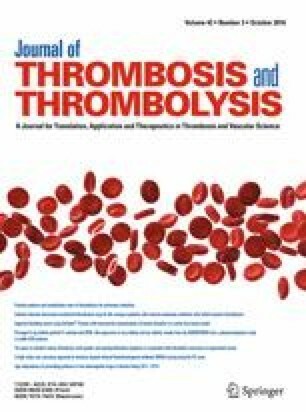 Pras 5 mg reduced both ADP-stimulated platelet P-selectin and activated GPIIb–IIIa in VE (p < 0.01 for both analyses) and NE (p < 0.001 and p < 0.05, respectively). Clop 75 mg had a similar effect as Pras 5 mg but did not significantly reduce activated GPIIb–IIIa in VE. Prasugrel 10 mg resulted in decreased platelet activation in both age groups compared to Clop 75 mg (p < 0.01).Conclusions: In VE and NE-patients, Pras 5 mg inhibited platelet P-selectin expression similar to Clop 75 mg and Pras 10 mg. Prasugrel 10 mg inhibited platelet P-selectin expression better than Clop 75 mg. Prasugrel 10 mg and 5 mg, but not Clop 75 mg, significantly inhibited activated GPIIb–IIIa in VE. This platelet reactivity data support the use of Pras 5 mg for VE patients. Sponsored by Daiichi Sankyo Company, Ltd. and Eli Lilly and Company. DE has received fees for being a speaker from Daiichi Sankyo Company, Ltd. and Eli Lilly and Company, AstraZeneca, Sanofi-Aventis and Accumetrics and for being an advisory board member for AstraZeneca, Eli Lilly and Company, and Merck. HW has received grants from JOLIFE Sweden AB/Physio-Control Inc. and has consulted for Eli Lilly Sweden. JJ, KW, CZ and PB are employees of and minor shareholders of Eli Lilly and Company. CL, OG, CB and LT have no conflicts to declare.